If you are looking for a nightmare inducing stay in a motel filled with clowns, The Clown Motel in Tonopah, Nevada is going to hit the spot. Complete with a clown theme throughout, this little oasis in the desert is also next to a cemetery so you can see where the literal bodies are buried. 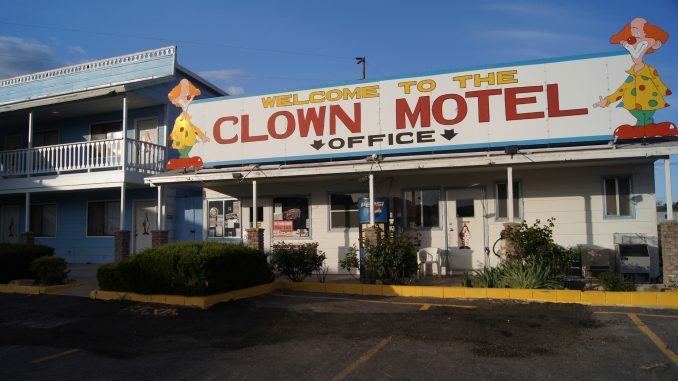 Voted by Fox 10 Phoenix as “one of the scariest motels in the West”, The Clown Motel should probably make list the scariest motels in the world. A legitimate motel catering to long-haul truckers, motorcycle riders, and the occasional tourist seeking a roadside attraction they can tell their friends about, The Clown Motel provides exactly what they advertise, clean rooms and a place to rest a weary head. 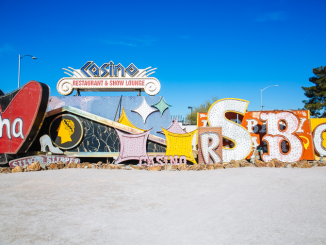 At an elevation of 6,047 feet, Tonopah, Nevada, rose out of the high desert roughly halfway between Reno and Las Vegas in the late 1890’s when silver and gold were discovered. The story goes that a man was throwing rocks at his runaway burro (because that’t a good way to get a burro to come back) and discovered gold in the process. The people that left homes in other cities, in the quest to become rich mining the gold and silver in Tonopah, took little from hard dry earth more than blisters and callouses before eventually leaving for bigger cities and brighter futures. The ones that continued to mine and never left Tonopah became the inhabitants of the cemetery. Today, Tonopah is known as a recreational area famous for high desert hiking, bird watching, wildlife viewing, mountain biking, and because it has little nighttime light, stargazing. The night skies are considered to be among the best in the continental United States for those wishing to view the stars. There are also other places to stay while in town. The Clown Motel was voted as one of “The Scariest Motels in the West”. Check-ins are stopped after 11:00 pm. The motel only features “happy clowns”. The Tonopah Cemetery is just a few feet from motel check-in. Pets are welcome at the Clown Motel.